With our daughter gone on handcart trek this week, my thoughts have turned to her pioneer heritage. My wife and daughters are descendants of Zurviah Gleason Fuller and James Eardley. For those of you who know my wife, you will see a resemblance between her and Zurviah, especially if you knew my wife as a teenager. 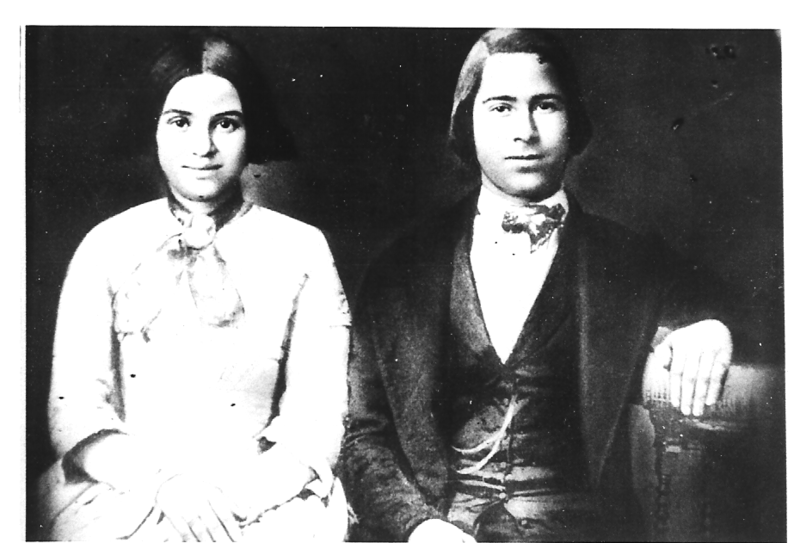 This engagement photo of James and Zurviah was taken in St. Louis, Missouri in 1852. 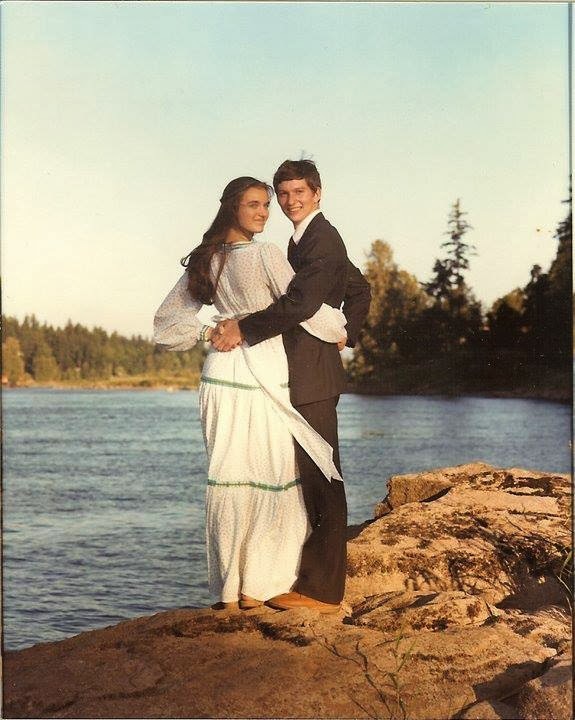 The photo of us was taken shortly before our engagement in 1979. Zurviah was 17 years old when she got married; my wife, 18. I was 12 (just kidding, but I look like I could pass for 12 in the photo). Zurviah was a direct descendant of Edward Fuller who crossed the Atlantic on the ship Mayflower. When Zurviah was 16, she wanted to get an idea of who she would marry, so she applied a “sure fire” method for finding out, which I don’t recommend. One night, she swallowed a thimble full of salt, and without drinking any water, walked backwards to her bed. The procedure was supposed to produce a dream wherein her future mate would offer her a drink of water. Zurviah had a dream, but could only see the ulster (coat) of the man who offered her the drink. I suspect other girls she knew were doing this. The following spring, she saw a man at a church meeting who was wearing the identical ulster she saw in her dream. That man was James Eardley. They married on March 15, 1852. The couple was anxious to travel to Utah. They had next to nothing, so James urged that they cross the plains by handcart, as their faith would yield more blessings. Zurviah—ever practical—responded that she would receive all the blessings that she could desire if they crossed by ox and covered wagon. They finally were able to travel to the Salt Lake Valley in 1854 in the James Brown Company. James Brown was a member of the Mormon Battalion and the founder of Ogden, Utah. James (Zurviah’s husband) actually was delayed and came with a later company. A woman by the name of Turpin was widowed, and the captain of her company advised her to return to St. Louis because she was slowing down the train. James knew it would be too dangerous for her to travel alone because of Indians, so he volunteered to drive her wagon to the valley. Zurviah and her husband lived in Salt Lake City, between 600 and 700 South off Main, at 21 Eardley Place. James died in 1914, and Zurviah passed away in 1928 at the age of 96. Up until her death, she would travel by streetcar several times a week to the Salt Lake Temple to work there. Thank you for Zurviah's story! I am going to Martin's Cove with my ward in August & we were asked to represent a pioneer ancestor. I had planned on “being” Zurviah and my husband is representing James. She is my 4th great grandmother. I have been searching for a picture of her. How exciting! Thank you so much! I would love anything else you have about her. I am also interested in anyting else you have about Zurviah and James Eardley. I am doing research of this family for a good friend of mine who is a descendant of these two special people. There is a book called The Eardleys—Utah Pioneers by Preece. I only have a small portion of that book, but I think you can get it on microfilm or maybe even digitally from the Family History Library. It is the source of the information I shared in the post. I hope you can find the whole book! I am a descendant of Zurviah's younger brother, Francis Walter Fuller. I am trying to discover the circumstances of Zurviah's conversion. She was baptized at age 13, but no one else in her family was baptized until her older brother was baptized six ydears later at age 20, and then a year later my ancestor, Francis Walter, was baptized at 13. The parents were not baptized during their lifetime. Do you know anything about Zurviah's conversion story? If not, do you know anyone who might? Thank you very much for posting the photograoh. Does your wife have any more photos of Zurviah? Hello cy1951, According to the book The Eardleys—Utah Pioneers, Zurviah was baptized in on September 25, 1854, Willbraham, Massachusetts. It also says, on page 12, that her parents were converted. Walter Fuller was separated from his wife, Eunice Gleason Fuller, but Walter later moved to Salt Lake City later where he lived with Zurviah until his death on September 25, 1855 at age 49 (page 13). He died of consumption. What do your records say? Thank you for the information! Zurviah was my 3rd great grandmother. I am very interested in what the origin of her name is? Also in her conversion story it is stated that she was baptized in 1854 which is the same year she arrived in the Salt Lake Valley? I am assuming this was just a typo? Rob, new.familysearch.org lists Zurviah's confirmation date as 1 January 1846. I assume that the baptism date in the book on the Eardley's is perhaps incorrect. Thank you for commenting!